Today is our first wedding anniversary. We've been married for a whole year. I guess it's safe to assume this is probably real. It seems like way too long for it to have been just a dream. So far marriage has been the best ever. Even though life thought it would be such a funny punchline to make us spend most of our first year of marriage 6 kajillion miles apart (approximately). A few weeks ago Pete asked me what I wanted for our anniversary. (In hindsight, I wish I'd said "A treehouse.") But at the time, I suggested that we do something to celebrate when he gets home. 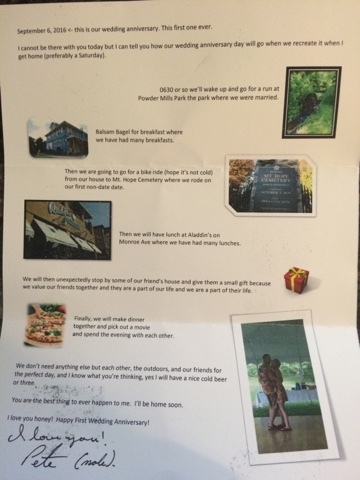 So Pete sent me a card with a plan for our anniversary adventure day. And of course it is totally and perfectly us. I sent him a package of cookies from Get Caked, where we got our wedding cake and cookies, and another package with dark chocolate. Eating a piece of your wedding cake on your first anniversary is one of the few traditions I agree with. Though I had no way of sending still edible and not smushed cake to Afghanistan, so cookies and chocolate would have to do. In one of the cards I wrote, "I think we need a treehouse and a giant bear statue for our backyard. What do you think? Eat this chocolate if you agree!" Yesterday, while I was on an epic Tramily roadtrip adventure to Fillmore Glen Park with Danielle, Laura, Alison, Bob, Steven, Todd, Mort and Brooke, I got a message from Pete that said "I think we are getting a treehouse and bear to guard it because I was eating chocolate while reading your funny card." Score! I had an epic holiday weekend, capped off by a fabulous Labor Day filled with friends, funny conversations, a 15.5 mile trail run, waterfalls, hills, legit fancy picnic-ing, hiking and sunshine. The only thing that could have made it better was if Pete had been there too. Or if he was off having fantastic adventures of his own instead of being sleep deprived and stressed out. I could tolerate the separation so much better if I knew Pete was happy to be there. Still, he makes the best of every situation. I totally love that about him. He is quite impressive in every way. Today when he called to wish me a happy anniversary, he deadpanned "Is it how you imagined it would be?" I laughed. He laughed. Because that is what we do. Obviously this is not the anniversary that either of us would have wanted. But marriage is not about everything always turning out how you want. It's taking all the random crap and nonsense and sweetness and suckiness that life throws at you and making it into the most awesome sauce, together. I feel like a broken record for always saying this but it's true. I am the luckiest. To have Pete in my life. And such a supportive and loving community surrounding us. Cheers to many more years of laughing and adventuring, through happy times and hard times. And to getting that treehouse! Marriage is a sundae topped with awesome sauce in a fancy treehouse. Lyric of the moment: "If the sun refused to shine, I would still be loving you. When mountains crumble to the sea, there will still be you and me...And so today, my world it smiles. Your hand in mine, we walk the miles..." ~Led Zeppelin "Thank You"